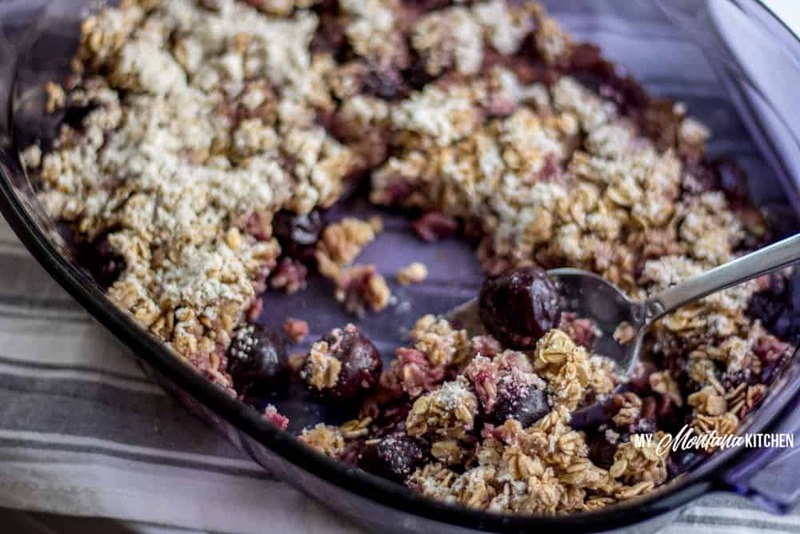 Sweet cherries topped with an easy oatmeal crust. 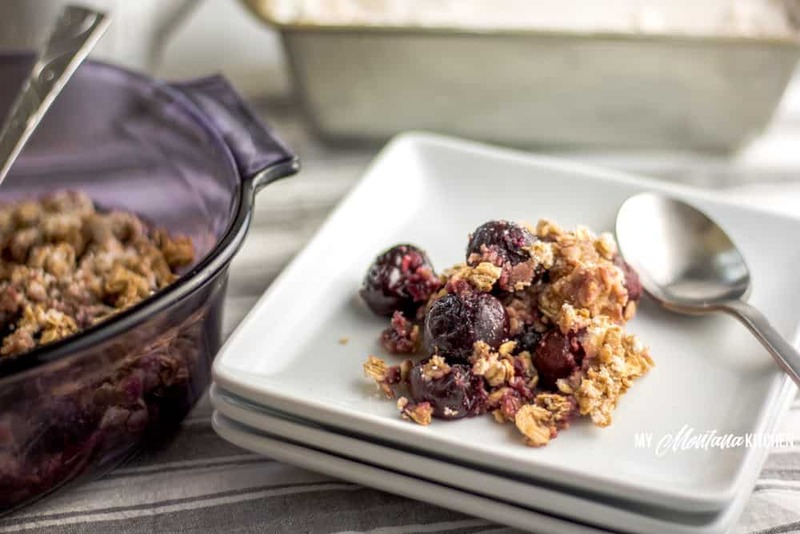 This Cherry Crisp is easy to make and is a great way to use frozen cherries. 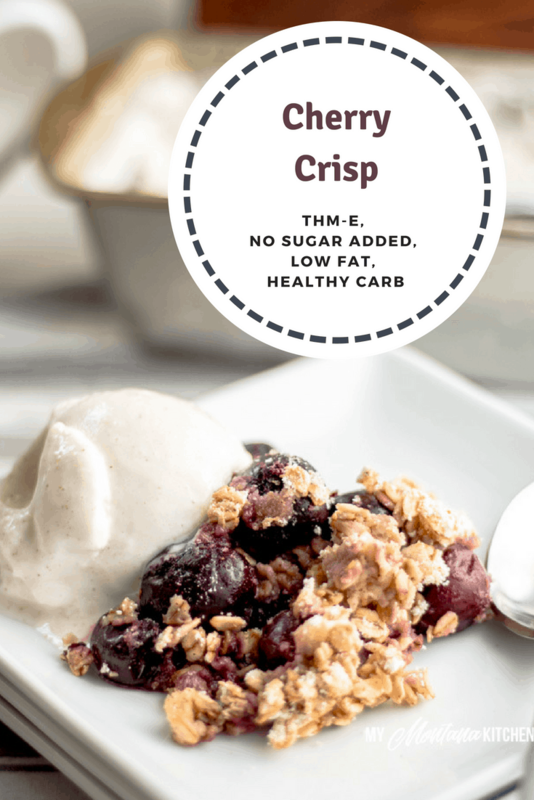 This easy Crisp Recipe can be enjoyed as a Trim Healthy Mama E Fuel, but it is also dairy free, gluten free, and has no sugar added! Someone recently gifted me a large amount of tart pie cherries. (Thank you, you know who you are!) This has had me thinking about different ways to use cherries in recipes. Up to this point I only had two cherry recipes on my blog, and that was my Cherry Kefir Smoothie and Cherry Kefir Ice Cream. Cherries are a tiny powerhouse of nutrition, so it is a good idea to have a good repertoire of recipes that use them! Here are just a few of the benefits of cherries! They are a good, healthy carb source. Cherries promote the production of melatonin, which helps you sleep better. They are especially powerful against breast and prostate cancer. They encourage the release of serotonin, the feel good hormone. Cherries fight belly fat and help to keep you full for a longer period of time. They are very anti-inflammatory and can help to reduce arthritic pain and overall body inflammation. Cherries can lower the risk of gout flares. And cherries can help reduce the amount of muscle pain felt after exercising. As a Trim Healthy Mama, I have often seen people fall into the “S Fuel” rut. (In fact, I’ve done it often myself!) But we must remember that Trim Healthy Mama is a balanced approach to eating, and including those healthy carb sources is vitally important! 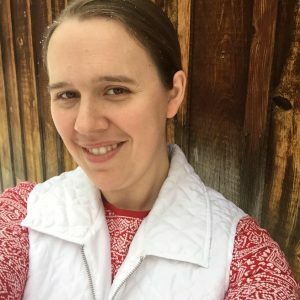 I have seen a lot of people treat the Trim Healthy Mama plan as a low carb diet, but it IS NOT! THM separates fuels, but does not eliminate one or the other. So make sure you are getting plenty of Healthy, Energizing E recipes in! 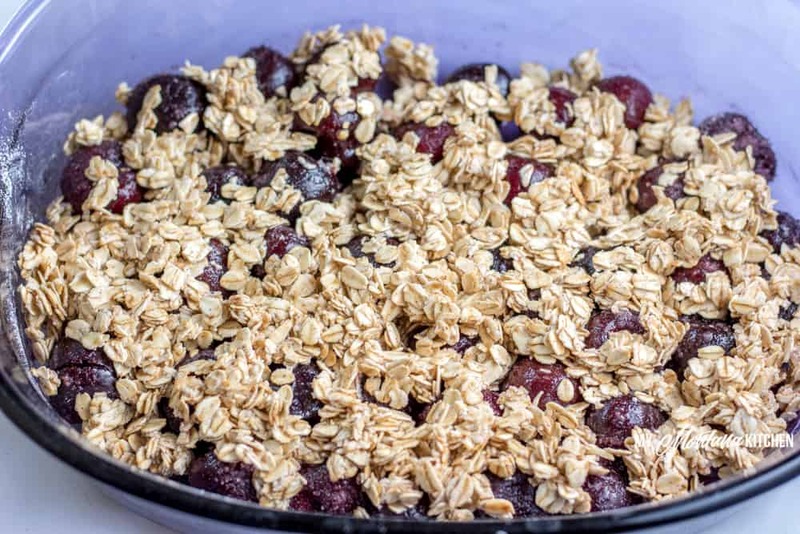 Both cherries and oatmeal are good, healthy carb sources, and this Cherry Crisp recipe uses them both! I simply coated the cherries with the sweetener, then mixed up the topping and poured it over the cherries. This cherry dessert is delicious when warm, straight from the oven. I love to top it with my Fuel Pull Frozen Vanilla Yogurt with Cinnamon. 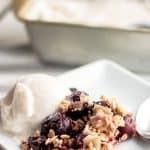 Can you believe that you can have a delicious warm, cherry crisp topped with “ice cream?” It is so delicious, even my kids liked it! I always call a recipe a win when my kids approve (especially since one of them is quite picky)! I actually wouldn’t feel bad eating this for breakfast – with the Vanilla Frozen Yogurt. Pair it with a collagen coffee and I’m ready to tackle the day! If you would like a single serve recipe, you can check out my Healthy Peach Crisp. It is a single serve recipe that can be made in the microwave. This recipe makes four generous servings of Cherry Crisp. However, I wouldn’t eat a full serving of this dessert if you have already eaten an E meal, as it would likely put you over the suggested carb count for an E meal. I would use it as a stand-alone snack or small meal, with some added protein (such as 0% Greek Yogurt or Vanilla Frozen Yogurt). But if you wanted to divide the recipe into smaller servings (6 or 8), you could have a serving after a lighter E meal. Makes 4 Servings, and is delicious served with Vanilla Frozen Yogurt. And if you make a recipe, please leave a comment on my Facebook Page or tag me on Instagram (my_montana_kitchen_thm) and let me know what you think! I love to see photos from my readers! 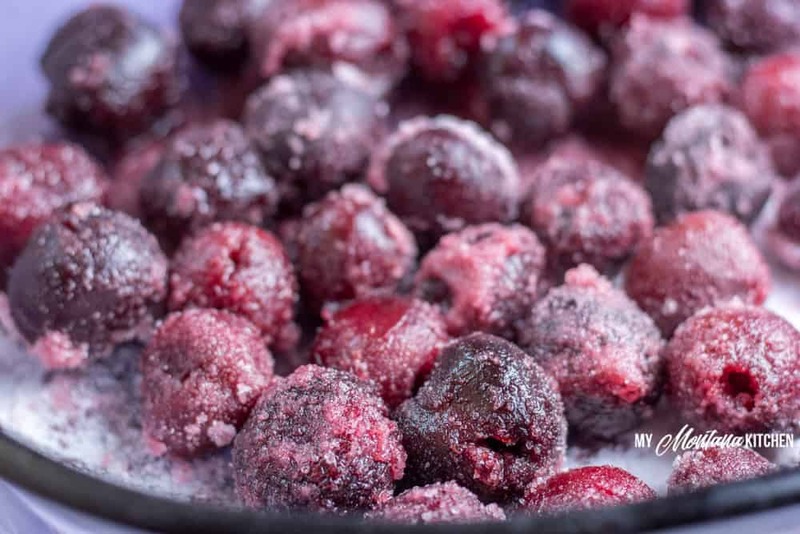 In a 2 Quart Baking Dish, combine frozen cherries and Gentle Sweet. Mix well, to coat the cherries. In a separate bowl, mix all the topping ingredients together, then pour over the cherries. Bake for 30 minutes, or until topping begins to turn golden brown. This recipe makes four generous servings of Cherry Crisp. However, I wouldn’t eat a full serving of this dessert if you have already eaten an E meal, as it would likely put you over the suggested carb count for an E meal. I would use it as a stand-alone snack or small meal, with some added protein (such as 0% Greek Yogurt or Vanilla Frozen Yogurt). If you don't have Gentle Sweet, you can use my Low Carb Powdered Sugar in equal amounts. Thank you so much for this awesome Cherry Crisp. No fancy ingredients made it a quick-fix even the first time I made it.. Tempted to keep one in the fridge, for sweet tooth moments. This looks absolutely delicious. My husband loves chocolate with cherries so I an thinking about adding a Tbsp or 2 of cocoa powder. Has anyone tried that yet?